A casting call and search for the lead role in a new Disney show is underway! Disney Channel is now casting the 2 leads for the TV pilot of a new show, the reboot of the classic “Boy Meets World” called “Girl Meets World“. Casting directors are now holding auditions for teenagers to play the main parts and the casting breakdowns have gone out (see below). The new Disney show is “Girl Meets World” and it picks up where “Boy” left off. Disney Channel and their casting directors have begun a nationwide casting search to find the perfect teen girl who will play the part of Riley Matthews, the “Girl” in “Girl Meets World”. “Girl Meets World” is the next generation of the hugely popular ABC show “Boy Meets World”. “Boy” was a coming of age story that had a little bit of everything… comedy, teen awkwardness, high school friendships, drama and fun. “Boy Meets World” was a sitcom about the lives of teens, Cory and Topanga. The new Disney show is about Cory and Topanga’s daughter, Riley. The part of Riley has yet to be cast and auditions are going on now to see who will play this great part. Besides the role of Riley, The role of Maya is also available (see casting breakdown below). Maya is Riley’s best friend in the show and both girls are 13 years old as the series begins. Riley Mathews is the new star of “World”, like the 90’s show, she too is in her early teens and entering a new chapter of her life. “Boy” was told from Cory’s point of view, “Girl” will be told from Riley’s. Boy meets World began in 1993 and ran until 2000. The new show brings back some of the old cast but now it is 20 years later. Cory and Topanga are no longer kids or teens. In the new show they actually play the parents and the show now revolves around the life of their daughter, Riley. Cory and Topanga where a favorite teen couple of the 90’s and now, in the new show they are married with a teen of their own. In the new series, Cory is a teacher and his daughter Riley has a best friend named Maya with whom she spends most of her time. “Girl Meets World” brings back Ben Savage and Danielle Fishel, Cory and Topanga. 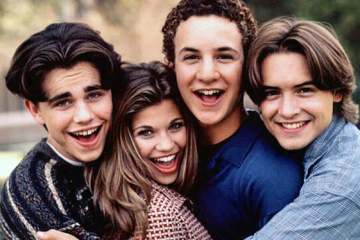 The show “Boy Meets World” had been a huge success and the show filmed countless episodes over 7 years. Danielle and Ben grew up on the show over its long run-time and both stars have commented on how excited they are to do it again. “Girl Meets World” is still in the very early stages of the show with only a pilot planned so far. Auditions are taking place in 2013 to find the new kids to star in the show as the “old kids” now get cast as the adults. The new Disney show is hoping to get casting wrapped up early next year and then begin production of the TV pilot and any other episodes that the network orders. No word yet as to if any other old cast members will revive their previous roles in the new show. Whether we see the old cast members return as adults is unknown but most certainly many of them will be seen in episodes as guest stars. Disney Channel is hoping to introduce a whole new generation to Cory, Topanga and family and the upcoming auditions will surely make some teenage actor’s dream of being the lead in a Disney hit show, come true. Casting is going on now for the main roles and series guest stars and extras will be cast as production gets closer. Right now it looks like the show will be going into production in early 2013 and may be released later that year. So who do you think should be cast as Riley Mathews and Maya in Disney’s “Girl Meets World”? hi, my name is Justin Lampkin. It would be nice to have a role because watching people make a difference on a tv screen is amazing. Any role would be okay with me even if it means playing the smallest part that would still be a great opportunity for me. I almost forgot to tell you, I am 10 years old and thank you for this amazing opportunity for me. Hi I really like your show Girl meets world, it is so funny! I’d really like to be on it, thanks! My name is Lexi gerace. I’m 14, I have brown hair and brown eyes, my ethnicity is Caucasian. I love acting and I’ve participated in many plays at my school and a few of fashion shows as well. I would love to be a part of girl meet world. I am going to 7th grade and I would love to be on girl meets world, please call me. I would love to audition for any Disney show. I hope you can consider me! Hi, I’m Amanda Pacheco. I know you already have a cast but I would love to be an extra or maybe have a small part. I have been watching “Boy Meets World” since I was little and I love it! I love to act, I have been in plays at my school and also my best friend and I did little acts for our parents when we were younger and I just love it so much. I think this would be an amazing experience. Hi I’m Abbigale McCullough and I’m fifteen years old. I have fair skin, red-blonde hair, and blue green eyes. I have a sweet, quirky, and sassy personality. I am a signed client to mtm. I can play younger or older. Hi I’m Samantha you can call me Sam. I’m interested in the part of Maya because I can relate to her. I do well in front of the camera and I have the drive to be on television then work up to movies. I also play volleyball and basketball. Hi Disney Channel producers,directors, and casting directors!! I’m Olivia and I am 13 years old! This seems like a wonderful opportunity to be apart of what seems to be yet another, Disney Channel hit show! I do have acting experience. I go to acting classes every week at a place called Stage Right. I also do musical theater at a place called Apple Hill Playhouse during the summer. I have done kid friendly musicals such as Alice in Wonderland, The Enchanted Sleeping Beauty, etc. I have done many different roles(one time I played 3 roles in one musical)! My acting teacher tells me I have a big personality, which is a good quality to have as an actress. Sadly, I don’t have an agent. But hey, neither did Selena Gomez when she was on Barney. Her mom took her to that audition. & look where she is today!I have watched re-runs of Boy Meets World. Aside from acting, I also LOVE to sing. I’m in my schools chorus group and I have sung numerous solos at church. I am 5 foot 1 and I weigh 105 pounds. I have dark hair, dark eyes, and light skin. I would love to be able to get a shot at this. Every movie star, pop star, and Disney Channel star has to get their start somewhere, am I right? If you are interested in giving me a shot, feel free to email me. Thank you!! Hello, my name is Brooklyn. I am 13 years old and will be 14 in July. I played Scuttle in my school musical, and I am now multiple characters in the school’s play, Thurber Carnival. I am 5’3. I have long curly brown hair and green eyes. I have a mix of Riley and Maya’s personalities. I enjoy improving my skills and I hope that this audition will give me the opportunity to do so. I used to watch ‘Boy Meets World’ before school with my dad and I think it would be amazing to be able to do that again. Well except I’ll be on the screen this time, which will be a fantastic feeling. Hi I’m Haley Jones. I know everything about “Boy meets world.” I really want to be on this show because this is my dream and I would be ever so greatful xD. I am witty and can take direction and deal with change easily. Thank you so much. I’m 5’55, African American, and have long black hair. I am 13 years old and I have blond hair and blue eyes. I love acting and singing and have been in all of my school plays, and this year I was the lead in “High School Election”. I was also in the gifted and talented chorus in my county, and I love to sing. I play soccer, lacrosse and basketball. Please contact me, I love singing and acting, and it has always been my dream to become a professional. I am 16 years old and I have watched Boy Meets World ever since I was little. When I heard of Girl Meets World I was so incredibly excited. Working on this how would be an absolute dream come true. I have always wanted to act but was never given a chance. I think I would be great for a part of this show because of my knowledge of this show. I am so bubbly, enthusiastic very easy to get along with and funny but most importantly I’m very hard working. I take constructive criticism very well and I am determined in bettering myself. A role in this production would be an amazing opportunity. One to cherish and learn from. Thank you so much. Hello, my name is Zashel and I wanted to be an actress ever since I was a little. It would mean a lot to me if I got the role of Riley. I’m 13, I can act, I have brown hair and brown eyes. Please contact me, it means a lot to me if I got this role. My name is Lisa and I am turning 14 in two weeks. My brothers inspired me to become an actress when I was really young and now that’s all I want to do. I want to be able to help my family with money and I think this is a good way yo do it. Please contact me as soon as you can. I have dark brown hair and dark brown eyes. I am 5’1 and I think that I could play either Maya or Riley. I can relate to both characters in a way. I’m a 14 year old Indian boy and I love boy meets world. I would love to be an actor in the show girl meets world. I would love a chance to be on disney channel. It’s my dream, I want to work as an actor so I could take care of my sick mom. My name is Anzhelika. I’m 14 years old and I live in Toronto. I’m so inspired by Disney projects because they motivate me to dream big and set an example to follow. I speak French and Russian fluently. Since I can remember I was always a part of something creative. I started singing when I was 5 and I was always involved in acting, dancing, fashion. I was a host of a TV show for kids for 4 years. I’ve had an experience of photo shoots. As I was growing up my favorite shows were “Hannah Montana” and “High School Musical.” At school I would put my music on and imagine myself in a musical. Now I’m ready to become part of the next Disney adventure and become a new star on my favorite channel! I Would Love To Act On This Show Contact Me So I Can Show What I Got…..
Hi I’m Darian. I am 14 years old and a heck of a actor and singer. I have performed in many plays and also competed in beauty pageants. I am very outgoing, so if you give me a chance too show you what I got, I guaranty you won’t be disappointed. I’m an actor, and I would love to audition for these roles. I’m 16 years old, Caucasian, brunette with blue eyes, and around 5’2. Give me a chance and you won’t regret it. I would like to try out for Riley or Maya because I think I have the talent. Well thank you So Much for your time hope you give me a chance. hi ! my name is Tiffany and I would like to play the character Maya. I would also accept the role of Riley. I love to sing and act and I am 12 years old with strawberry blonde hair and blue eyes. I really hope I can get the part, thank you for taking the time to read this, yours truly Tiffany.